So you changed from velours to MB-tex? I was hoping for a golden tip as to where to buy the original velours look-a-like! Sorry, i have no tip for you... the old velours was about 40 years old with holes & color changing through the sunlight. Hi Daniel. Very nice machine. I was hoping for a golden tip as to where to buy the original velours look-a-like! Other than a custom run - forget about it. It's more of a unicorn than 6.9 SLS valves. So they'll need 100x80 euros, is 8000 euros for the cloth. GAHH charges 35% of that for a full kit in MB tex. Cabrio will need more money to turn cloth into a kit as well, not? Let's say, another 4000 euros. Could they not make 5 complete kits for 12000 euros? Even 4 kits would be great. Should be easy to find takers for that. Where do you think the problem lies? They currently have about a dozen fabrics in stock now, with 2 yard minimum. you would have to inquire as to price. I bet they would also sew the seats for you if you ask. In finding enough people who are prepared to part with that kind of money for a set of seat covers in a specific colour. But not the velours we're trying to source, not? 8)I have totally hijacked this thread.. Do you mind, honorary member from Germany? welcome to the forum, like your car! Es gab indertat eine Stille im Forum, ein bestimmte Spannung, Sachen die ungesprochen blieben.. Muss wohl dieser Boombox gewesen sein! 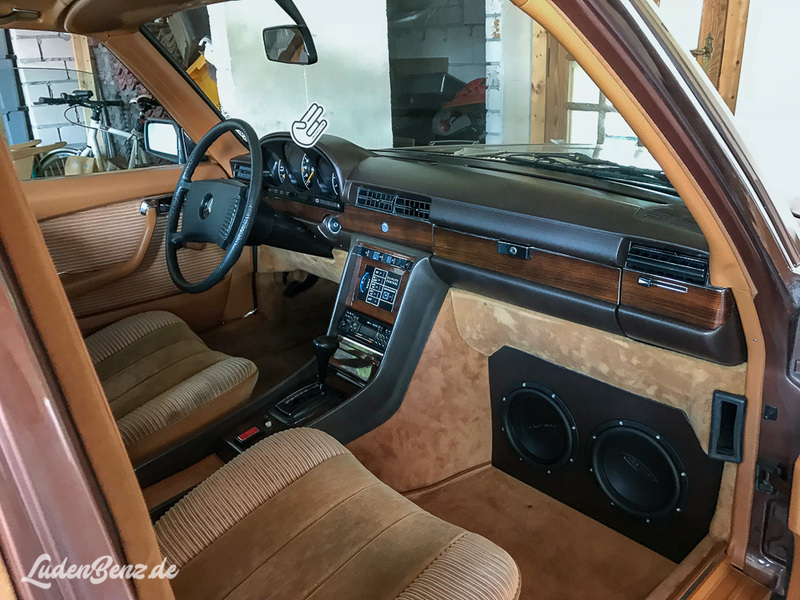 Jeder weiss wie unmoeglich es ist high-end Audio in ein W116 ein zu bauen. Deine Idee ist sicherlich neu, und funktioniert sicherlich gut, ist aber haesslich, und nicht freundlich entgegen Leute mit lange Beine. Der Kofferraum bietet besseres in dieses Beriech, bietet so aber keiner toller Sound. Ich habe ein JL-Audio 10-inch bass, flaches Modell, fuer die Erste Hilfe Box gekauft. Hoffe das das besser klingt als ein Boombox im Kofferraum. Bleiben da noch die mid-range Lautspraecher. Nicht einfach. There was, however, a silence in the forum, a certain tension, things that were left unsaid .. Must have been this boombox! Everyone knows how impossible it is to build high-end audio into a W116 one. Your idea is certainly new, and certainly works well, but is ugly, and not friendly towards people with long legs. The trunk offers better solutions in this area, but so not a great sound. I bought a JL-Audio 10-inch bass, flat model, for the first aid box. Hope that sounds better than a boombox in the trunk. Then there still the mid-range sound speakers. Not easy. I thought long and short about subs, but after seeing the naked chassis, all hope seems lost. More ideas would be great! I am struggling with the mids. The pioneer DEH I have needs 3 sets of speakers, and 3 amps for the system to work. I thought about placing the mids under the front chairs, in a slide-able custom-made wooden box with the same covering as the carpets. I have only done some rough measurements, and it's a tight one. Maybe you have looked into this before?